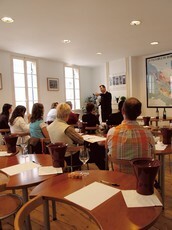 Join us at the Wine School of Saint-Emilion for a moment of pleasure and tasting. A unique wine tasting course held Monday to Saturday during 1h45 minutes. The “PACKAGE The ultimate food and wine experience” This magical day is meant to be a great time of relaxation and exchange around wines. Fabulous tastings, fabulous food and prestigious chateau visits. By reservation only!